Low levels of conflict violence were largely due to the electoral ceasefire carried out by the FARC and the ELN from May 20-28. According to the Colombian conflict resolution and analysis center CERAC, there were no reported incidents of conflict-related violence by the ELN, four reported incidents of violations by the FARC, and threats reported in the Catatumbo region by an armed dissident faction of the Army of Popular Liberation (EPL). (See the CERAC report here.) CERAC concluded that the ceasefire demonstrated the clear command-and-control of the FARC Secretariat and the Central Command of the ELN over their troops, and the ability of the two organizations to coordinate for common purpose. This augurs well for the insurgents’ ability to deliver on fulfillment of a peace agreement and confirms the ELN’s readiness to engage in talks, which have been on hold during this electoral period. In the aftermath of Sunday’s elections, everyone is re-calibrating their strategies and alliances. Santos and Zuluaga have been courting the losing candidates from the first round, particularly the female candidates, who each pulled in close to 2 million votes. Conservative Party candidate Marta Lucía Ramírez garnered 15.52 % of the vote, despite not having the full support of her party. Clara López Obregón of the Alternative Democratic Pole (PDA) brought in a respectable 15.23 % for that leftist coalition. Enrique Peñalosa of the Green Alliance, who earlier polls predicted could win the elections but who lacked the political machinery of the other parties, garnered 8.28 % of the votes. The left is divided between those who are casting their lot with Santos to defend the peace process and those who seek to maintain an independent opposition role. This week the Patriotic Union leadership, led by Aída Avello, called on its members to re-elect President Santos, “given that in the current circumstances he represents peace through dialogue.” (See article here.) Other major leaders of the left, including PDA Senator and Chair of the Senate Peace Commission Iván Cepeda and Patriotic March leader Piedad Córdoba, have announced their backing of President Santos and the peace process. (See “Piedad Córdoba confirma que votará por Santos.”) Bogota Mayor Gustavo Petro announced that his Progressive party would work for Santos’s reelection but maintain its independence outside of Santos’s National Unity coalition. It is too soon to tell how the numbers will stack up. The polls show the candidates neck and neck, and are inconclusive. A poll carried out days after the first round of elections by the firm Cifras & Conceptos for Caracol Radio and Red + Noticias showed Santos ahead with 38% to Zuluaga’s 37%; 15% of those questioned said they would cast blank ballots, and 10% remained undecided. (See poll conclusions here.) A National Consulting Center poll last night showed Zuluaga ahead with 47% of the vote to Santos’s 45% and some 8% casting blank votes. (See conclusions here.) Considering the margins of error, the candidates appear to be tied. Nonetheless, much can happen in the coming weeks as leaders of other political forces and civil society weigh in and the candidates seek ways to gain their votes. It is not clear yet whether the peace issue will determine the electorate’s voting positions for the run-off elections on June 15th. Pre-electoral polls had suggested that voters were not giving much weight to the issue of peace in relation to other issues in the run-up to the first round. (See my earlier blogposts on the subject.) Since Sunday’s elections, however, the candidates have been jockeying to play the peace issue to their best advantage. Zuluaga, ex-President Alvaro Uribe’s hand-picked successor, is considered a hard-liner when it comes to peace. On the morning after the election results were in, Zuluaga announced that as soon as he was inaugurated on August 7, he would decree a “provisional suspension of the talks in Havana so that the FARC would decide if they want to continue with a negotiated peace.” Zuluaga noted that the FARC would have to “cease all criminal actions” and agree to a “verifiable and permanent ceasefire.” He pledged to seek mechanisms to reduce sentences for crimes committed, but insisted that the FARC would have to serve jail time, a condition that FARC has refused and that could be a deal breaker for the peace talks. 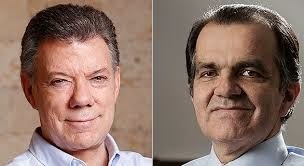 Forty-eight hours later, on Thursday, May 28, Zuluaga modified his position in a move that President Juan Manuel Santos called “cynical” and “electorally-driven” (“electorera”). The shift came as part of Zuluaga’s effort to woo Ramírez and the Conservative Party and was laid out in a pact between Zuluaga and Ramírez that was signed by 40 Conservative Party legislators and guaranteed by the vice presidential candidates of both parties. (See “Pact for Colombia” here.) The 14 programmatic areas of the pact include Zuluaga’s new position on peace. There Zuluaga pledges that his government would “continue talking with the FARC in Havana, without agreements behind the country’s back, with conditions and deadlines that guarantee tangible, definitive, verifiable advances, with international accompaniment.” The pact calls for a public evaluation of the first three agreements that have already been reached in Havana, and, within Zuluaga’s first month in office, a series of “gestures for peace” from the FARC, including the immediate cessation of child recruitment, the cessation of further use of land mines and provision of maps that would allow the government to begin immediately de-mining the affected zones, an end to “terrorist attacks against the population,” a cessation of war crimes, and a suspension of attacks against infrastructure. Furthermore, the agreement stipulates that the government would set a deadline with the FARC for completing the negotiations and would require the FARC to cease kidnapping, extortion, and any activities related to drug trafficking. Many of Zuluaga’s demands address the humanitarian concerns of the broader Colombian populace, and these issues are already on the agenda of the peace delegations in Havana. The problem is really one of process and attitude. Insisting on a series of pre-conditions that ex-President Ernesto Samper has called “unfillable” could shut down the talks. (See “El giro de 180 grados“). Years of efforts to attain peace by setting pre-conditions through the “microphones”–i.e. making demands in the press–have not proven to be successful in the past. In his effort to appear tough on the FARC, Zuluaga has not yet shown much nuance in his thinking about how to make a peace process work. If he really hopes to pursue peace, he would do well to learn from the experiences of those at the table who have managed to nurture a common vision for the country and have modeled mutual respect in their negotiating process. This attitude of respect is essential to the ability of either of the candidates to deliver a peace accord. For Santos, who has defined his entire presidency around the peace talks in Havana, a Zuluaga victory would torpedo the peace talks. “Neither history or the new generations would forgive us” if we failed to bring the peace process to fruition, Santos said this week. He floated an innovative proposal that the negotiating teams might consider dividing into two teams to work on the remaining agenda items–terms of ending the conflict and victims–in order to accelerate their momentum. Santos’s challenge right now is selling a highly skeptical population on his ability to deliver a peace agreement with the FARC. Santos has recent history somewhat in his favor. His team in Havana has shown itself to be highly adept. It has developed a working relationship with the FARC team, a framework agreement that has proven to be an effective guide for the talks and for negotiating differences, and a methodology that has delivered agreements on agrarian reform, political participation, and, most recently, illicit crops and drug trafficking. Finally, working in Santos’s favor is that the parties remain at the table, have made steady forward progress on their agenda, and unanimously agree that they are likely to reach a final agreement. In comparison with other peace processes around the globe, the Colombian process stands up quite well and has many lessons to offer. This is not to say the process has been perfect however. Some of the public skepticism is related to the government’s decision to pursue peace in the middle of war. In addition, the government’s exclusion of civil society from the peace table and its lack of a peace pedagogy to manage expectations and help shape public opinion about what a peace process can and can’t do has undermined perceptions of its work. In this past week, we have seen a new push by the Santos administration to refine its approach. Humberto de la Calle and Sergio Jaramillo, leaders of the government negotiating team, were out speaking to the media and at public forums about the peace process. De la Calle insisted that there are many fallacies about the peace process that undermine its credibility, and the negotiators acknowledged that there is room for improvement in communicating with the public and educating them more about the peace process. (See “Lanzan campaña nacional“). Hopefully, it will not be too little too late.